"I'm a better person than you are because I forgive you for ruining my life!" "Me ruining YOUR life!" I screeched at my twenty-six-year-old son. "What do you think has been happening to MY life since you were fifteen years old?" A slight smirk spread over his face as I sputtered on about the sacrifices I had made for him, how hard I'd worked, how much love and care he'd been given. He knew I'd been hooked and reeled back into the dance. This is the story of one family's experience with a loved one's irresponsible, painful, unpredictable behaviorâand the path that led that family to sanity. 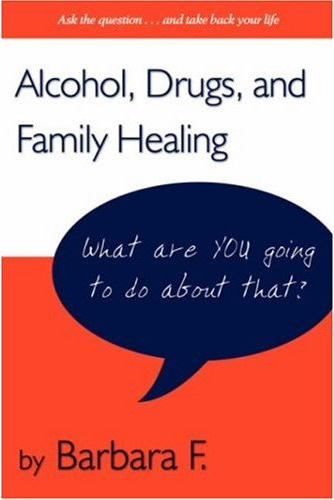 Filled with both personal accounts and proven methods from the author's experience as a specialist in the drug and alcohol recovery field, this guide has helped hundreds of families heal and reclaim their lives. "Thank you for helping our family find our way out of the dark place we had lived in for so many years. Our daughter is clean and sober and living on her own now . . . We feel at peace for the first time in years." "Thank you for helping me find a way out of the abusive relationship that had done so much harm to me and my children . . . He has finished treatment and is living in a halfway house. I don't know that we will get back together, but at least the kids now have parents who can express love to them without fighting each other." "Thank you for my sanity. Thank you for my financial security. If I hadn't realized that ruining myself financially in attempt after attempt to rescue my son wasn't doing either of us any good, I would have ended up broke and with no hope." "My guilt has finally been eased. I never knew that I didn't have to be a martyr or a victim. And I have a life I like now . . . I have set boundaries with my alcoholic sister that leave us room to still be friendsâmaybe not close friends, but friends nonethelessâand have relieved me of having to rescue her from her own messes. Thanks." One afternoon, just before the holidays, I found myself talking about some really tough love with my new husband. "Bob, are you sure we should do this?" I asked. "Is there anything else left to do?" he responded. The night before, he had found me pacing around the living room at 3 am. I told him that I was thinking about canceling all holiday celebrations because I couldn't face the prospect of another special occasion ruined by alcohol and drugs, even though they were not served in our home. The suspense was just too much. Even on those occasions when my son showed up in good shape he was still edgy and defensive. I would feel my whole body tensing up, just waiting to see what was going to happen. It was always the unexpected, and it usually happened when I was just relaxing and starting to tell myself that everything was going to be all right. Slowly, I had started to behave as if I had no control over what happened in my own home. I had volunteered to be a victim by allowing things to continue on the way they had always gone. During that middle-of-the-night talk, we decided to do an intervention on my son before the holidays. We started making careful plans. Canceling the holiday celebrations for the whole family, which now included Bob's family as well as my own, would be letting drugs and alcohol rule our lives, too. So we talked about how to conduct our own little intervention. It had to be planned carefully. We invited my son over to dinner. We didn't do that very often due to his escalating drinking and drug use, so I was certain he would know something was up. While listening for his car, I went over in my mind what we had decided to say, what tone of voice I was going to use, and what incidents I wanted to talk about. Some of my examples would be hard for my son to hear, and they would be even harder for me to say. I planned to describe my terror on the night that he had almost pushed me off a balcony in a rage fueled by alcohol and crystal meth. He was furious because I had refused to give him the keys to my car. The next day, when his friends told him what he had done, he showed up at my door, but this time in tears apologizing and telling me how much he loved me. It broke my heart, but from that time on I was afraid of him when he was drinking and using. Once, his sister and I even called the police to take him away from our home, and she and I spent the night in a motel because we were afraid he would come back. Next, I planned to describe the Easter dinner when he arrived several hours late, obviously high and bringing a lady friend who he belligerently introduced to family and friends as a stripper. Although no one objected to her profession, he continued to behave in such a hostile manner that everyone simply got up and left, including me. There was the drunken motorcycle accident that he and his pregnant passenger miraculously survived, but required a long hospital stay and a lengthy recuperation at my home. I, of course, volunteered to nurse him back to health only to come home one night to the smell of burning rubber. I discovered that he had gone down to the beach and gotten so drunk that he fell into a fire pit and burned the crutches' rubber handles. I remembered my knees giving way and sitting down hard on the couch. In my ignorance of his addiction, I had thought that the terrible accident had "taught him a lesson." I decided it would be best not mention too many instances, but I did want to cite examples that carried a lot of emotional pain for me and, hopefully, for him too. I reminded myself to use a steady tone of voice and not add anything more. I had been in too many losing debates with him to think that I could win any sort of argument or discussion. No matter how it started out, I always ended up defending myself and trying to justify anything I had said. I told myself that, no matter what happened, I was going to stay calm, but I still felt myself flinch as I heard his car door close. The moment he walked in the door, he could tell that something was different. I saw his jaw muscles tighten, but he kept on smiling. We calmly told him that we had been considering canceling all holiday celebrations but had come to the conclusion that we would have to cancel his part in the family instead. We told him that his only gift under the tree would be an envelope that would guarantee substance abuse treatment for him, and he was invited over to pick that up only on the condition that he showed up clean and sober. We added that he had to be in good enough shape so that no one would be nervously waiting for him to explode over some little thing. He would be asked to leave if he appeared to be impaired in any way. I said I hoped he would accept our offer of treatment because I loved him so much and didn't want a repeat of any of the experiences that had been so hard on everyone involved. Then I began a shorthand version of my planned remarks. At first he sat listening, almost stunned. Then he exploded, bombarding us with four-letter words. He said that if this was the way "family" treated its own, then he didn't need any of us. He told us where we both could go. He raged on for several minutes, saying that his life was going along just fine. He said he was okay and in better emotional shape than any of us. My husband looked at him steadily and said, "You are not okay. You are pathetic." "Maybe we're wrong. Maybe he really isn't using drugs or drinking anymore." "Maybe, if we just try to make him feel better about himself, he'll pull himself together." "Maybe we should just try to ignore the situation." I suppose the endless string of excuses and wishful thoughts could have gone on to infinity but, in my heart, I knew I had taken off my blinders and could never again pretend I didn't see reality. My son was pathetic, and it was time that someone spoke the truth right out loud. Whatever came of it, nothing could be worse than the insanity of going on this way. The lies, the little cover-ups, the "kindness" that looked the other way, the silence, the secrets were all conspiring to keep my son drinking and using until he overdosed or killed himself or someone else in an accident. My Al-Anon sponsor was helping me gradually see that every time I softened a blow or lessened a consequence for my son it took away another opportunity for him to learn and grow through painful consequences of his own faulty decision-making. Looking at it from that point of view, I began to see that all of the people in my son's life who thought they were helping him were literally in the process of loving him to death, the same way I was. Months later, my son told me the one word that stuck with him and wouldn't let go was "pathetic," because deep inside he knew it was true. Once his anger subsided, he knew that the person who had said it felt he was strong enough to hear the truth with no sugarcoating. And that gave him a strange feeling of pride, but he couldn't understand why. He said that from that time on he began to think about trying to get clean and sober, but it seemed an impossible dream. He had used alcohol and drugs for so long that he could not imagine life without them. But he was scared, too. He was starting to drink and use constantly. In many areas of his life, he was running out of options. Now he was losing his last ties with his family. He started to think that it might be worth a try.